A month between posts, again. Fortunately, it has been a great month and an encouraging start to 2012 and my build-up to what comes next. I pretty much look at everything that I’ve done up to the present as little more than a prelude to what’s ahead. For me, the last 10+ years of running and 23+ years of fitness are now my backdrop for the next in an uncertain series of new challenges. While there will be a lot of interim challenges over the course of 2012, the big one is my first attempt at running 100 consecutive miles, hopefully in less than 24 hours. I’m looking at tackling the Cactus Rose 100 Mile Endurance Run on October 27, 2012 back out at Bandera, Texas. I ran the 50-mile version of the race in October 2010 and know that a finish for the 100, in any amount of time, is far from a given regardless of how well I train. There are just too many variables to ever feel too confident about doing anything successfully for 24 hours straight. Add in extreme physical exertion of running all day and all night and into the next day, over steep hills covered with loose rocks and countless pokey things, and with the knowledge that the effort will be roughly twice as long as anything I’ve ever attempted, and there’s no telling. But I’m going to give it a shot. With this in mind but still most of a year away, my recent training has been two-fold. First, I want to continue to improve my speed, since faster paces at shorter distance usually translate to faster paces at longer distances. I kicked off 2012 with a New Years Day 5K where, despite a bit of a breakdown in dietary discipline in the weeks before and little rest, I was able to set a new 5K PR by 45 seconds, beating my previous PR set on the same course the year before. 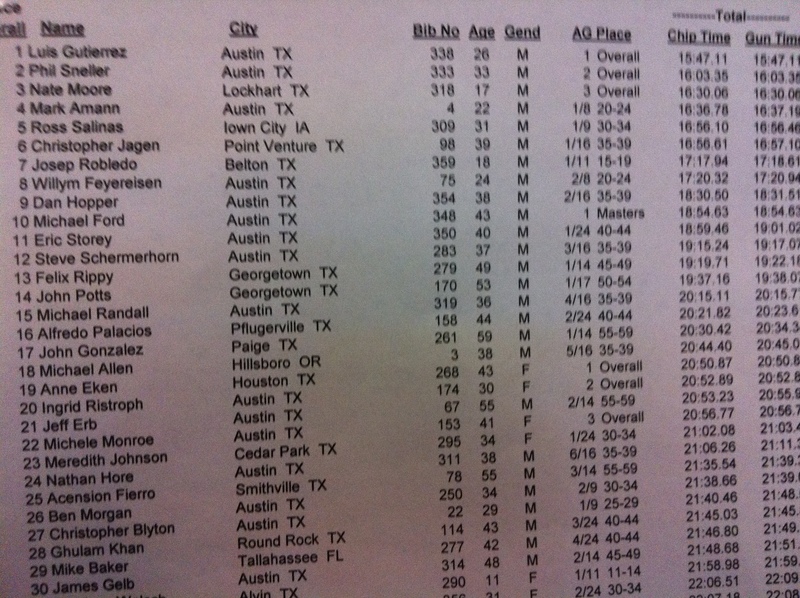 Good for 15th overall out of 345 runners. And I am absolutely sure that I have a good bit more speed in me so I’m trying to tap it. I really haven’t ever concentrated primarily on speed over shorter distances. And I’m not exactly making that my main focus now but am doing 2-3 workouts a week that will at least help. I also plan on jumping into shorter (10K and under) races whenever I can to see where I’m at. One of the more interesting events I’m eyeing is a 1-mile race, The Manzano Mile, where I’ll get to see what my true 1 mile time is, at sea level, on a track, no excuses. As a decidedly non-miler, I may well embarrass myself, even running at the best of my potential. Most of the guys in my heat will probably have times starting with “4” and my current best is 5:39 but it’ll be fun to see what I can do. The second, and arguably much more important, path to completing the 100-miler is getting my body prepared for the rigors of relentless miles over tough terrain. Runners approach ultra-marathon training in different ways but most agree that to be able to run a lot of miles you have to train by running a lot of miles. So, that’s what I’m doing. Over the last few years, as I’ve ramped up my running volume, I’ve typically run somewhere in the range of 40-55 miles a week most weeks, with peak weeks in the 70s. A few times I’ve gone higher, most notably a 90-mile week this past summer. For 2012, I’m shooting for something more along the lines of a 70-miles-per-week average, with a number of weeks closer to 100 miles, body permitting. To track my progress and remain accountable, I’m keeping my 2012 mileage on a spreadsheet, so feel free to check out how I’m doing. The frequent, really long training runs (20-30+ miles) will probably not start until summer. In the meantime, I’m mixing quantity with quality, with at least a couple of two-a-day runs per week. To keep myself from breaking down, I’m increasing strength and core work and eating as much nutrient-rich food as my stomach can handle, basically all day long. Still, I’ve been working around a tweaked right ankle and a few other minor issues so time will tell how much training load I can handle. I’m happy to say, at least, that I’m enjoying the miles and the variety in training. 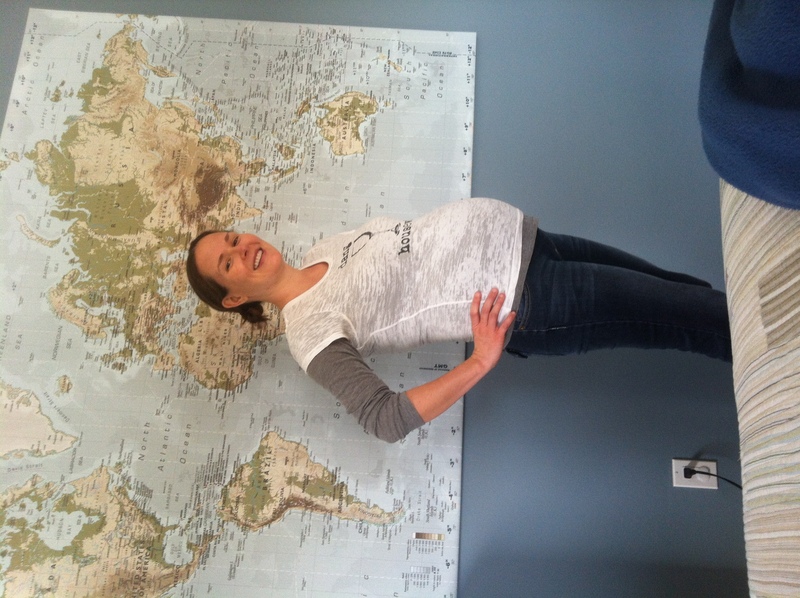 With a new baby arriving any day now, all of my determined plans remain somewhat tentative. Let’s say that, as I’ve outlined in this post, my training and racing aspirations are something of a best-case scenario. One way or another, at least I’m left without any doubts that 2012 will be eventful, if not entirely restful. I’m eager to get in as many miles as possible with friends and look forward to a year of adventures, big and small. No freakin’ way, a 100 at Cactus this year? Didn’t you say you want 2 years to train for it? Mid-life crisis? That was my excuse:) Keep on going on. And don’t forget to text me when the picture above changes! Well, Olga, two years is a long time to train specifically for anything. That particular timeline was with Leadville in mind, which is still a possibility for 2013, though I’m no longer looking to commit to anything that far out. There are just too many variables, though the biggest one is making sure that I’m (at least mostly) enjoying the process of preparing for whatever I set out to do. I have mini mid-life crises every couple of years, which I am convinced helps me avoid – or at least delay – a singular big one. As recently as a few years ago I wouldn’t have imagined that 10-20+ mile runs would be just an ordinary part of the day so it is hard to say what my motivations might be in a year or two. Maybe endurance cooking?